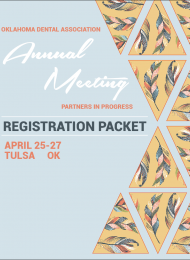 There are numerous opportunities to be involved with organized dentistry in Oklahoma. 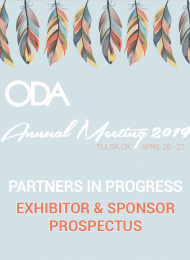 Please consider sponsoring one of the items listed below to enhance your presence during the 2019 ODA Annual Meeting. For questions about sponsorships, contact Lynn Means at 800.876.8890 or lmeans@okda.org. Thank you to our Official Sponsors of the 2018 ODA Annual Meeting! These ODA meeting sponsors have demonstrated their support of dentistry in Oklahoma through their generous contributions. The ODA has been successful, largely due to the continued support of these friends. Please support these companies by visiting their website.